LG might be readying new colorful edition for the Nexus 5 flagship after all. First we saw what seemed to be an official Play Store listing with six new colors - yellow, red, blue, green, orange, and purple. Unfortunately this turned out to be fake. And just when we thought the rumor is dead, we saw a red Nexus 5 posing in front of a camera. Today we get to see something better - a whole batch of red-flavored Nexus 5 retail boxes. You can see official markings, IMEIs, serial numbers and everything. 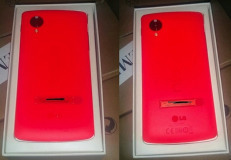 It seems the red Nexus 5 is real and will probably launch shortly. The previous rumors suggested a yellow edition is coming too, so those six new flavors might deserve the benefit of the doubt. This phone's so sweet in red. It's a shame about the battery though, otherwise I'd get it just for the sake of owning a Nexus.